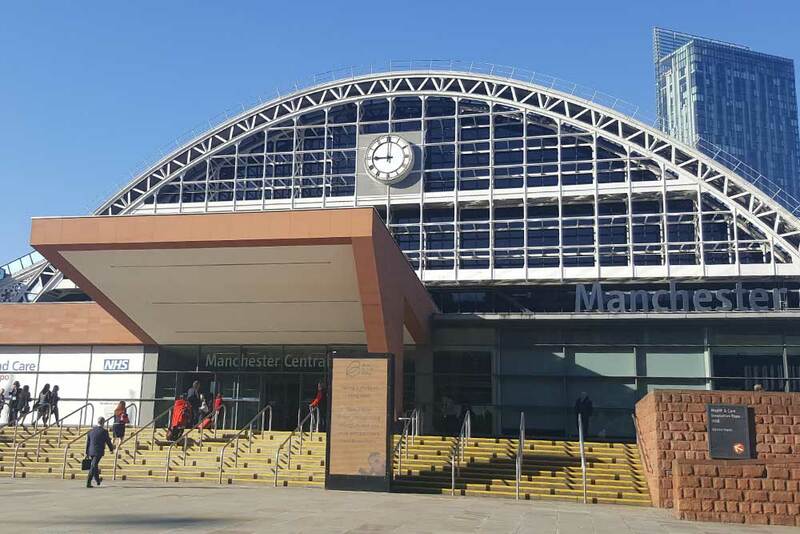 Expo18NHS in Manchester heard more about the long-term plan for the NHS and about progress on healthcare IT. 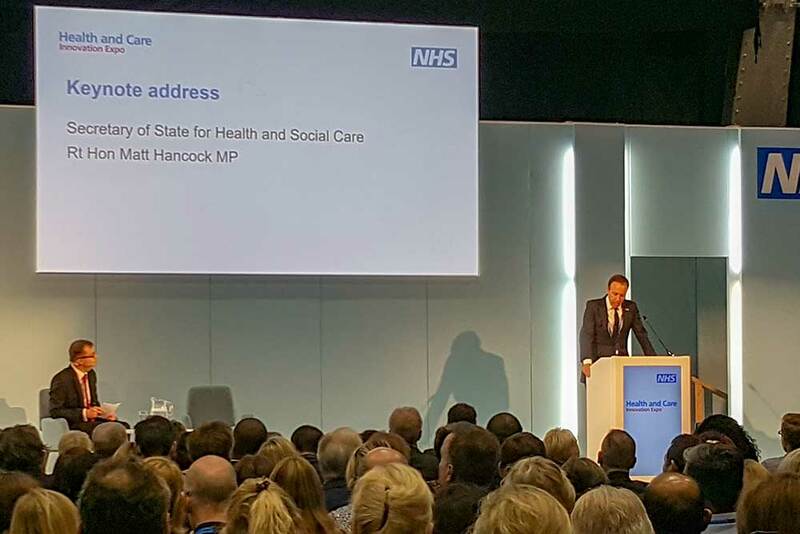 But all eyes were on new health and social care secretary Matt Hancock, who used his closing keynote speech to list current failings and urge suppliers and boards to do better. Lyn Whitfield reports. Not just for this winter. An ageing population, living with a growing incidence of long-term conditions, means “huge demand” is coming towards the health and care system over the next ten years. As things stand, it would need to increase capacity by 1,500 to 2,000 beds every year to cope. Or, to put it another way, it would need to build another 30 district general hospitals. Which, as Swindells often points out, is not going to happen. The new funding settlement of an additional £20 billion a year by 2020 [Reuters] that was announced for NHS70 would not cover building on this scale. And if it did, the NHS, which has 100,000 vacancies [Independent], would not be able to staff it. A different response was set out in the Five Year Forward View in October 2014 [NHS England]. It focused on creating new models of integrated care, in which services could ‘channel shift’ out of traditional settings and be delivered ‘closer to home’. Forty-four sustainability and transformation partnerships were set up to deliver the plan locally; and a handful of integrated care services (accountable care organisations) established to experiment with population-level planning and – eventually – payment. NHS England chief executive, Simon Stevens, has stressed that this agenda is not going away. At Expo, he said STPs and ICSs would be driven “further and faster.” But it is being refreshed with the development of another ‘long term plan’ that will determine how that £20 billion uplift is spent. NHS England had useful summary sheets ready for the Expo at Manchester Central. No fewer than 14 workstreams have been set up, covering ‘life course programmes’ (prevention, child and maternal health, long-term conditions and frailty), ‘clinical priorities’ (cancer, heart and lung disease, learning disabilities and mental health), and ‘enablers’ (including workforce and technology). The long-term plan’s big challenge will be to balance the need to get the acute sector back in the black and hitting targets with the need to pursue the STP/ICS transformation agenda. This came through clearly in an Expo panel session called to discuss whether it could be both “ambitious and achievable”. Other panellists called for steps to tackle some of the drivers of demand, as well as planning to meet it within available resources. National medical director Stephen Powis said he wanted to make sure the health inequalities gap “does not widen” and to address life challenges for children and young people, as well as the frail and elderly. Duncan Selbie, the chief executive of Public Health England, acknowledged the NHS could only do so much to tackle inequality. But he said it could, and should, tackle smoking, obesity, cardio-respiratory diseases and mental health [PHE press release]: working with other agencies through the STPs. Healthcare IT is a critical enabler of the Forward View agenda. Hospitals need better systems to drive productivity and quality, while integrated care systems need information sharing solutions to enable staff to see and act on key patient details, wherever they are working. Better analytics and new services for patients have also been on the radar for a decade. Unfortunately, as NHS England is increasingly willing to acknowledge, two failed programmes have impeded progress. First, the National Programme for IT failed on the widespread adoption of electronic patient records. Then, the care.data programme torpedoed public belief in NHS data collection and use. In his speech, Swindells said some of the commissioning board’s current work in IT is intended to get the health service “out of the PTSD of NPfIT and care.data”. So, on the one hand it is running a global digital exemplar programme to get “world class” IT into a dozen or so acute and a handful of mental health trusts, and to spread what they have learned to “fast followers.” And on the other it is creating a new data architecture to provide a “single source of truth” for NHS analytics. At Expo, Swindells insisted that the GDE programme is working. “A few years ago, even the best trusts were mediocre in world terms,” he said, “but I think we are close now to having five organisations accredited to HIMSS 7, and I would expect that to happen in the next six months. That £412 million of investment was confirmed by Matt Hancock in his first speech as health and social care secretary. At Expo, he added another £200 million of spending to an expansion of the GDE programme, which will be taken out to community trusts for the first time [digitalhealth.net]. NHS England has also been developing new, digital services for patients. 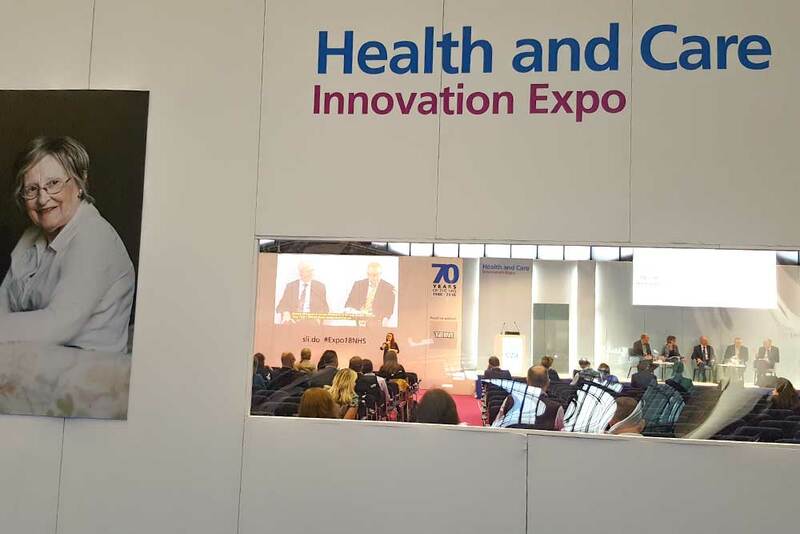 In a panel session at Expo, Juliet Bauer, the commissioning board’s chief digital officer, said the NHS Choices website had been re-platformed as nhs.uk. NHS Choices was designed to put consumer pressure on trusts, by enabling patients to compare the performance of NHS organisations and leave comments. The new site is all about helping people to “take control of [their] health and wellbeing”. 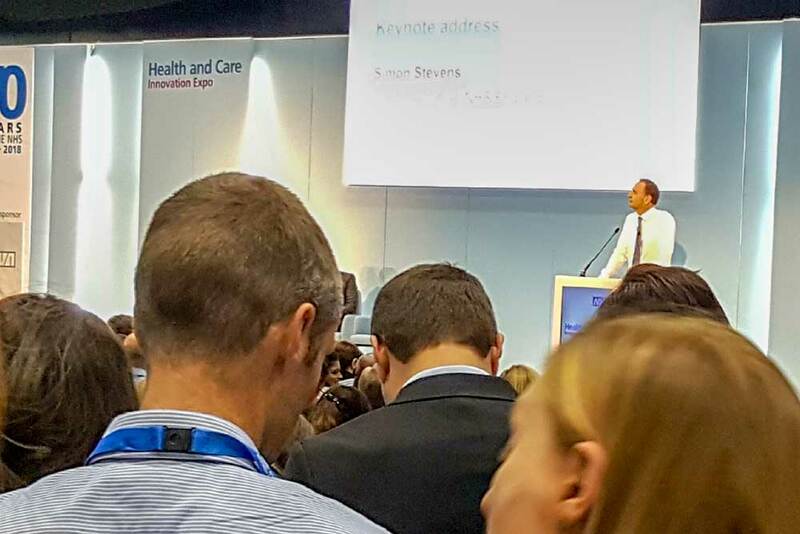 Bauer said progress is also being made on the NHS Apps Library, which has now received 500,000 visits and 50,000 downloads, and the NHS App that was announced by former secretary of state Jeremy Hunt at Expo last year. In his keynote this year, his successor announced that from October the app will be piloted in five areas (Liverpool, Hastings, Bristol, Staffordshire and South Worcestershire) ahead of a national roll-out in December [BBC]. Previews of the app [Gizmodo] suggest that it will replicate a lot of functionality that already exists, for example in GP booking apps and repeat prescription services. As well as driving innovation, she pointed out, NHS services were more likely to be trusted by the public, which retains huge confidence in the NHS brand. Swindells was in an unusually upbeat mood at Expo, and finished his speech with a vision of where all these developments could be going. He talked about having his entire health record “including genomic data” on his phone, and about this information being constantly analysed in the cloud, so that if he was eligible for a trial or a new drug, his GP could just email about it overnight. By contrast, Hancock was in a mood to be completely blunt about the failings that he’d seen on a nightshift in London and that he’d been told about in meetings with industry disruptors. “The NHS has too many systems that do not talk to each other,” he said. “Systems crashing is a regular occurrence. “The NHS is one of the biggest buyers of faxes on the planet. And it’s clunky, clunky, clunky. In many NHS trusts, people have two screens, not because they are working in a cutting-edge City trading desk, but because they have two computer systems running side by side. This last point was greeted by applause, suggesting many Expo attendees have little love for established IT companies. However, the secretary of state also laid blame on trusts, and boards in particular, for learning the wrong lessons from NPfIT and shying away from technology-driven transformation. Hancock didn’t just come to Expo with a list of problems. He also had a six-point plan to move forward. Step one: focus on interoperable, open systems. Two: make sure NHS organisations can “buy the right stuff”, by improving procurement capacity and splitting up contracts to encourage an “agile, iterative approach” to deployments [HSJ]. Three and four: support smaller suppliers and in-house innovation, to encourage a more diverse market. Five: develop a new skillset, so that technical skills are better spread across the whole health and care system, and six: encourage a culture change, so ideas can be tried, adopted or dropped faster. Despite his harsh words for NHS IT suppliers and boards, Hancock insisted he was “not looking for people to blame” for the current state of affairs, but for “people to lead” change. In this context, it was interesting that when he announced a HealthTech Advisory Board, chaired by Dr Ben Goldacre [National Health Executive], the first things he said it would do would be to “identify where change needs to happen” and “where best practice is not being applied.” Acting as an “ideas hub” for transformation came third on his list. 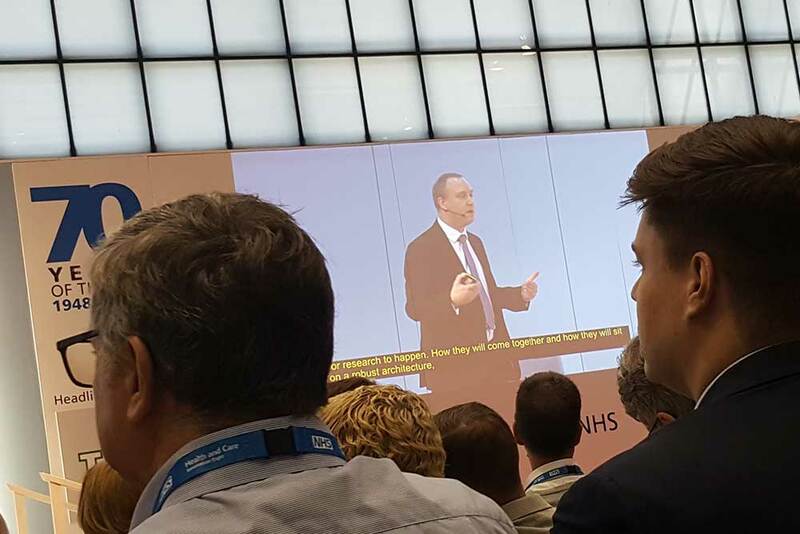 Hancock’s speech went down well in the ‘Future NHS stage’ in Manchester. But veteran NHS IT watcher Phil Booth told Wired magazine there was nothing in it that would help the NHS perk up for this winter. Also, the idea of a data-driven NHS is nothing new. Since the 1980s, all that’s changed is the approach to getting there. The 1998 Information for Health strategy relied on national infrastructure and local procurement of EPRs. When trusts spent ‘ring-fenced’ IT money on other priorities, NPfIT was brought in to do procurement and deployment for them. When it failed, trusts were left to their own devices. Now, the NHS is trying national standards and stern talking to boards. But, a “senior NHS clinical CTO” told Wired: “The internet doesn’t work because standards are enforced; it works because there is a commercial and social advantage to sharing data.” In the world of commissioners, trusts and local authorities, organisations have incentives to hold onto their own data. In the world of integrated care systems, they should have incentives to share it. But then they’ll need the technical and financial systems to do it. Squaring that circle might be achieved by telling everybody to work harder; but it’s more likely to be one of the critical challenges for the long-term plan. Lyn is a journalist by background. After completing her training in local papers, she specialised in coverage of the public sector in England, the NHS, and healthcare IT. This has enabled her to follow closely the many twists and turns of recent health policy; and to report on them for specialist audiences. It has also given her an exceptional ability to advise clients on the reality of working with the NHS, and on communications that work for them. Lyn’s skills include strategic thinking, managing projects with a communications and publication element, editing, research, interviewing and writing. Lyn has an impressive educational record, with a first degree in Politics, Philosophy and Economics from Oxford University, and a Masters degree in Social Policy and Planning from the London School of Economics and Political Science. Before taking up her current post, her journalism employers included the Health Service Journal and digitalhealth.net (formerly EHealth Insider). Over her career, she has also worked with think-tanks, including the King’s Fund and the Nuffield Trust, and major companies, such as Microsoft. Lyn is a proud Yorkshire lass, but lives in Winchester with her partner, a political cartoonist with his own live-drawing business. Her ‘downtime’ activities include Pilates and running; she has completed a number of marathons. Has NHS IT moved from Star Wars to Star Trek?